Vancouver, British Columbia / May 30, 2018 / Arctic Star Exploration Corp (TSX.V: ADD / FSE: 82A1 / OTCQB: ASDZF) (“Arctic Star” or the “Company”) is pleased to report that exploration has commenced on its Diagras Property (“Diagras” or the “Property”) located in the Northwest Territories, Canada. Diagras is a contributing Joint Venture (the “Joint Venture”) between Arctic Star, which holds a 40% interest, and Margaret Lake Diamonds Inc. (TSX.V: DIA) which holds a 60% interest, and acts as project operator. The exploration program will consist of Gravity, Magnetic and Electromagnetic (EM) ground surveys focused around historically identified kimberlites as well as other airborne geophysical anomalies with kimberlite like signatures. This ground work will provide detailed data for further analysis and interpretation to identify additional kimberlite potential and targets. 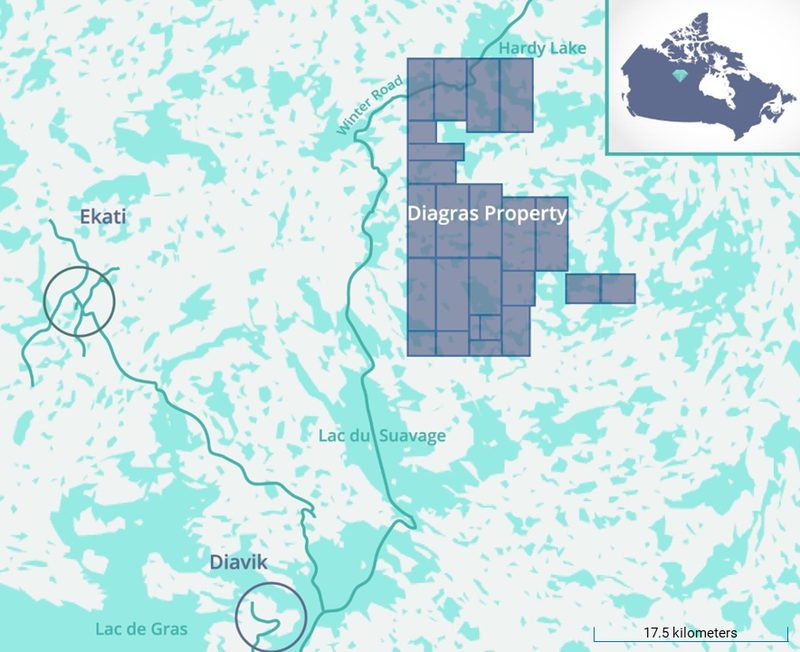 Diagras is located in the prolific Lac de Gras diamond field, Northwest Territories, Canada and just 35 km from the world-class Diavik diamond mine. The Property lies directly on trend with the Diavik deposits currently being mined by a joint venture between Rio Tinto and Dominion Diamond Diavik. The Diagras land package consists of 18,699 contiguous hectares of mineral claims containing 12 previously identified kimberlites. Detailed, modern ground geophysical techniques are being employed to define possible additional kimberlite(s) or kimberlite phases missed by previous explorer De Beers Canada, who did not utilize all these techniques. This exploration approach has been successful elsewhere and recent examples include the discoveries of additional diamondiferous kimberlite at the Kelvin and Faraday kimberlite complex (Kennady North project). A second example that further validates the exploration premise is the Tli-Kwi-Cho DO 27, DO18 kimberlite complex also located in the Lac de Gras diamond field. It comprises multiple eruptive/intrusive events of kimberlite, each of a different style and with different geophysical expressions (Mag only, Mag and EM, Gravity, EM and Gravity). The Joint Venture was also successful using this strategy during the spring 2017 exploration program. This work revealed gravity and EM anomalies proximal to known magnetic kimberlites that constitute compelling drill targets. At the Jack Pine kimberlite, which is one of the largest kimberlite complexes in the Lac de Gras diamond field (over 1.5km in its longest dimension), the geophysical methods (ground gravity, EM and magnetics) highlighted obvious magnetic kimberlite phases drilled by previous explorer De Beers Canada while also successfully defining a new kimberlite-like geophysical expression. This area remains to be drill tested. Previous drilling elsewhere in the Jack Pine kimberlite complex has demonstrated it is diamond bearing. Targets of great interest were also generated in 2017 at the Black Spruce kimberlite. A series of gravity lows occur adjacent to the south of the known magnetic phase of the kimberlite. One of these gravity anomalies clearly breaks and disturbs a diabase dyke, a characteristic similar to known Lac de Gras kimberlites. Additionally, Arctic Star is pleased to announce a non-brokered private placement (the “Private Placement”) of 1,130,000 units (the “Units”) at a price of $0.17 per Unit, for gross proceeds of $192,100. Each Unit will be comprised of one common share in the capital of the Company (each, a “Share”) and one non-transferable share purchase warrant (each, a “Warrant”). Each Warrant will entitle the holder to purchase one additional Share in the capital of the Company (each, a “Warrant Share”) for a period of 24 months from the closing date at an exercise price of $0.25. All securities will be subject to a four-month hold period from the closing date. The Private Placement is subject to TSX Venture Exchange (“TSXV”) approval. The Qualified Person for this news release is Buddy Doyle, AUSIMM, a Geologist of over 30 years’ experience in diamond exploration, discovery and evaluation.